I first encountered this error one Saturday evening while working from home. I have several devices sharing a not-so-good wireless router and I have experienced it a few times during periods of high internet activity within my house. I mention this because one of the common causes of this error is an abrupt closure of a TFS connection by the client machine which can be due to an unreliable internet connection. In my case, the cause was the first one. The quick resolution to this problem is to clear your local TFS cache. Don’t worry, this will not cause issues with any pending check-ins that you may have. Close ALL instances of Visual Studio and ensure that there are no devenv.exe processes running. Open My Computer and browse to your c:\Users\<UserName>\AppData\Local\Microsoft\Team Foundation\ folder and depending on the version of TFS that you are running, open the folder that corresponds to that version. Open the version folder and delete all files and sub-folders. 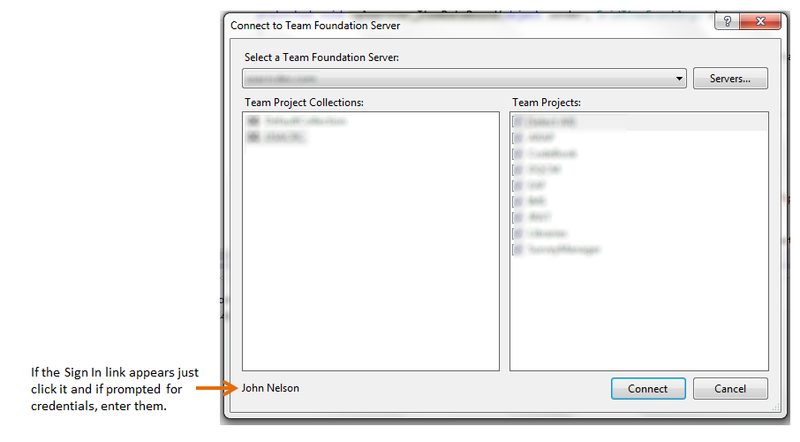 Open Visual Studio again and select Connect to Team Foundation Services from the Team menu. If the connection fails, find the Sign In link at the bottom left corner of the dialog box and click it. If you are prompted for your credentials, enter them and continue. See the screenshot below. Once you re-establish your connection you will see that all pending check-ins are still in tact and you are good to go. This entry was posted in TFS and tagged TF400324, TFS 2012, TFS 2013, Visual Studio, Visual Studio 2012, Visual Studio 2013.